Generally I keep politics out of this blog. Then I heard about pension smoothing. It is the latest sleight of hand trick in government and don’t worry, it is equally loved by all political parties and even many labor unions. On the surface it appears to be a victimless maneuver only affecting the millions of people counting on a future pension payment from American companies. So, what is pension smoothing? Simply put, pension smoothing allows companies to defer making mandatory contributions to defined benefit pensions plans in order to use that money for any reason they choose. Pension smoothing was added to a recent transportation bill that covers repairs to highways, bridges and subways saving the Highway Trust Fund from bankruptcy. Just to make the entire situation more complicated, in addition to funding the highway work, this bill also saves 700,000 American jobs. Here’s the risk: To solve the short-term issues of maintaining the nation’s road infrastructure; companies do not have to fully fund their pension plans which may mean more plans won’t have the money to meet their obligations to pensioners later. According to a survey by Pensions & Investments, a money management newspaper, the largest 100 U. S. pension plans were underfunded by $122.3 billion in 2013 and that was an improvement! Companies today put much of the retirement burden on the employees by focusing on 401(k) plans where workers cobble together a DIY strategy to save for the future. However, there are millions of employees counting on employer-paid defined benefit plan payouts for at least a portion of their wealth when they are too old to work. Pensions are in trouble as city and municipal workers in Detroit, Stockton, CA along with Pennsylvania school districts and other public employees across the country realize. Private sector pensions are no better as the retirees of Hostess Brands, who bring us Wonder Bread, Twinkies and other goodies, learned in 2012 when the company filed bankruptcy. The PBGC, Pension Benefit Guaranty Corporation, a government agency had to step in and rescue their plan. The concept of the PBGC is itself an oxymoron. The same Congress that is encouraging companies to delay funding their pensions has a safety net for 44 million workers covered by defined-benefit private pension plans, the PBGC. When private sector firms cannot meet their liability, the PBGC pays an amount less than the company-promised benefit, but it is something. 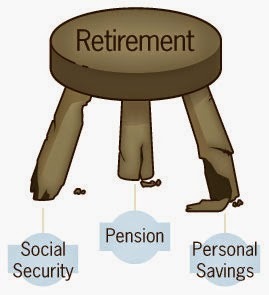 The problem is that in their July 3, 2014 annual report, the PBGC says it is “90% likely to run out of funds in 2025.” The biggest birth year of Baby Boomers will be 68-years-old in 2025 with plenty of life ahead of them, but maybe not as many job prospects.